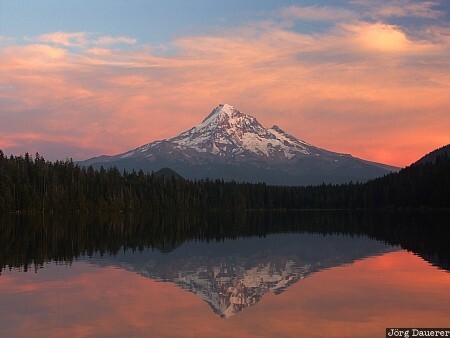 Colorful sunset clouds over Mount Hood and its perfect reflexion in the calm Lost Lake. Mount Hood is in the Cascade Mountains in northern Oregon, United States. This photo was taken in the evening of a sunny day in September of 2004. This photo is part of the exhibition Reflexions (February 2015). This photo was taken with a digital camera.